Contact Cédric LARZUL of LIEUX UNIQUES ® CHENONCEAUX in 06.25.26.16.76 for this magnificent property of the 15th century tufa stone completely renovated by its owner and located near Amboise, Clos Lucé, Chenonceau and Beauval Zoo, This historic building renovated by Louis XI in 1466 is impressive, entirely tufa. It has been completely renovated to welcome guests and business seminars. 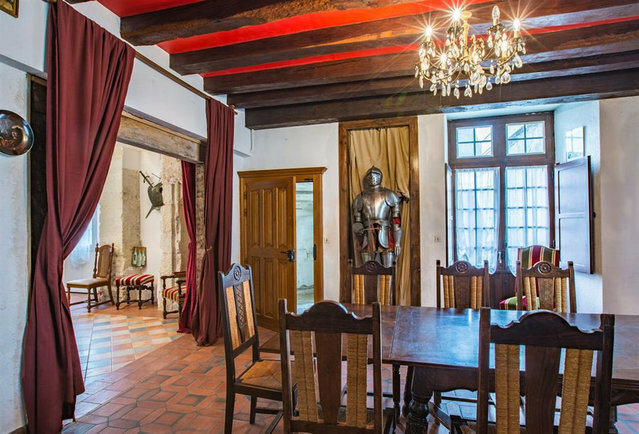 Exceptionally beautiful, this building is located 17 km from the ZOO Beauval, 8 km from Chenonceau, 15 km from the castle Amboise and Clos Lucé, ideal area to receive guests and tourists. It includes 12 bedrooms, beautiful bathrooms with WC, 5 kitchens, a main room for breakfast, a garden and a 5x3 indoor pool. A discotheque, a room of game, Tout with the sewer, Heating with gas of city. Property tax: 3,880 euros. The house has an apartment: including a main room, a bathroom, a toilet, a laundry room and a kitchenette for its owners. MY OPINION : Just superb in hyper-city center and perfectly renovated by its occupants. It feels good. The turnover of this guest house is about 135,000 euros per year. She receives guests but also business seminars. Everything is done to perfectly welcome visitors. MY ADVICE : For those looking for a conversion to this type of activity, there is no hesitation. From Paris, indeed, do you have the capital? Do not hesitate ! LIEUX UNIQUES ® CHENONCEAUX - Cédric LARZUL - 06 25 26 16 76 - More information on 3w lieuxuniques com (Ref LI1-047). The selling price is expressed Inclusive Agency Fees (F.A.I.) whose value is equivalent to 3.00% TTC of the selling price. Net Seller Price: 1.600.000 euros. Fees: 48,000 euros. - Luxury Real Estate LIEUX UNIQUES ® - Luxury Real Estate LIEUX UNIQUES ® - Charming Real Estate LIEUX UNIQUES.